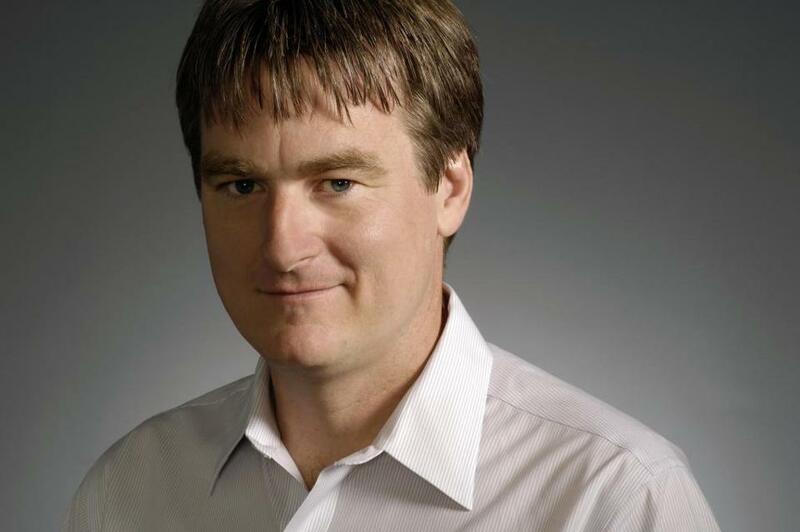 Kayak cofounder Paul English shaped apps that compare travel searches. 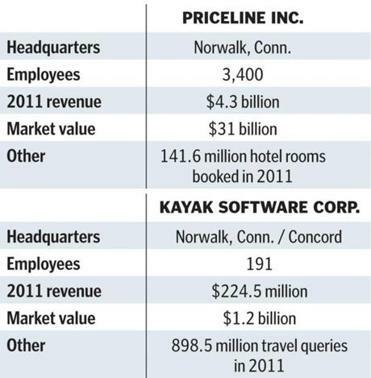 Kayak Software Corp., the New England company known for its quirky ­office culture and colorful executives as well as its speedy travel searches, will be acquired by Priceline.com Inc. for $1.8 billion in cash and stock, the companies said Thursday. The merger, if approved by shareholders, would join two of the best-known brands for booking hotels, rental cars, and airline tickets over the ­Internet. The deal would help Priceline build its US market, analysts said, while gaining access to Kayak’s Internet and mobile technology — and its stable of technologists. In a conference call with financial analysts, Priceline chief executive Jeffery Boyd said acquiring Kayak would bring his company talent and expertise in mobile applications, which have become increasingly important as more information is delivered over smartphones and other wireless devices. Priceline, known for its ­humorous TV ads featuring William Shatner, will pay $40 a share for Kayak, a 29 percent premium over its closing price of $31.04 Thursday and 54 percent more than its initial public offering price of $26 a share in July. The deal, said Henry Harteveldt, a travel industry analyst at Atmosphere Research Group of San Francisco, was just too rich to turn down. “If someone offered you $1.8 billion in an uncertain economy, wouldn’t you take it?” he said. The merger would create a $32 billion company to compete in an increasingly crowded market that has attracted powerhouses such as Microsoft Corp. and Google Inc. The entry of these players raised concerns at Kayak, which led an unsuccessful lobbying ­effort in 2010 to fight Google’s $700 million acquisition of ITA Software Inc. in Cambridge. ITA provides the underlying software that much of the online travel industry uses to provide price information for flights. “The Priceline Group’s global reach and expertise will accelerate our growth and help us further develop as a company,” said Steve Hafner, Kayak’s chief executive. Kayak declined to comment further. Kayak was founded in 2004 by West Roxbury native Paul English, the chief technology officer who oversees the ­engineering team in Concord, and Hafner, a former Orbitz executive who runs business operations in Norwalk, Conn.
Kayak was a pioneer in developing Internet applications that allow users to easily compare the result of travel searches from several different websites. Kayak.com quickly became known for fast downloads of search results from several different sites, and its mobile app has added to that reputation. Analysts have praised the mobile app for its simplicity and speed in comparing prices across travel sites. English, who declined to comment, is a fixture of the Boston area tech community. He often stressed the importance of maintaining the feel of a start-up even as the company matured so it could continue experimenting with new technology. The atmosphere at the ­Concord office is decidedly loose, with a kegerator, a refrigerator hooked up with a keg of beer, and a pool table downstairs. English has no customer support staff, requiring engineers to answer calls so they appreciate the problems people are having, English said in earlier this year. English even answers calls from customers himself from a big red phone on his desk and has been known to give out his cellphone number. Recently, English took a call from a woman who found his number posted on a bulletin board at a nursing home. Priceline executives said their company will focus on helping Kayak increase business overseas and further ­expand into the hotel market. Kayak, which does most of its business in the United States, may also help Priceline generate more revenue from the domestic travel market. Kayak reported $224 million in revenue last year and processed nearly 900 million user queries for travel information, almost double its 2009 traffic. Priceline developed a major presence overseas when it ­acquired the Dutch hotel booking company Booking.com in 2004. As a result, Priceline generates about 80 percent of its gross booking revenues from customers outside of the United States. Priceline has 3,400 employees and raked in $4.3 billion in revenues last year. The two companies are expected to remain separate brands, ­Harteveldt said, and if Priceline invests in Kayak and ­allows it to continue to grow, consumers should benefit from the deal. Hiawatha Bray of the Globe staff contributed to this report. Katie Johnston can be reached at kjohnston@globe.com. Follow her on Twitter @ktkjohnston.